Summer dining does not get any fresher than at the restaurant, Fresh Salt at the Saybrook Point Inn & Spa located in Old Saybrook, Connecticut. 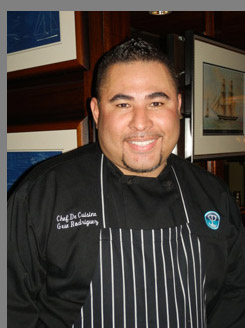 Chef de Cuisine Gese Rodriguez is the talent in the kitchen where he brings creative flair to farm-to-table and boat-to-table presentations to complement the stunning shoreline ambience. What we especially like about dining at Fresh Salt is that two things remain a constant: the food and the service are always consistently outstanding. 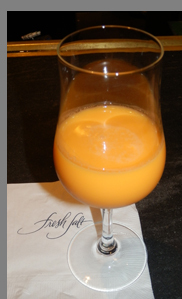 Another reason that we enjoy the restaurant is that there is always something new on the well-designed bar cocktail menu created by Bar Manager Peter Marshall, as well as on the culinary menu, to inspire our taste buds into trying something different. 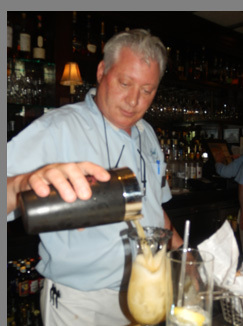 We had dinner at Fresh Salt in early June 2016, and began our experience by visiting with Peter Marshall and imbibing in one of his latest cocktail creations, the Hot Karma Margarita, which he makes by infusing Karma Silver Tequila from Connecticut with smoked chipotle pepper and letting it rest. When it reaches Peter's desired level of spice, he adds the infused tequila to Ripe Cold Pressed Margarita Mix and pours it into a chilled hurricane glass rimmed with Hawaiian Black Salt. This luscious and spicy cocktail is sure to cure whatever ails you, earning him the nickname, "Dr. Peter." Comfortably seated at a table overlooking the marina and their own lighthouse (which is available as a luxurious accommodation during the warmer months), we enjoyed the view and the spectacular sunset over the water. The restaurant has an excellent selection of wines by the bottle, as well as by the glass in 6-ounce pours perfect for pairing with different courses, or 9-ounce pours for those who prefer a larger glass of wine. We opted for wines by the glass so that could best complement the diverse flavors of our courses. We began with a selection from the Raw Bar section of the menu, the Tuna Sashimi with Wonton Matchsticks made with sushi grade yellowfin tuna, avocado, and bamboo sushi rice on a nori bed, drizzled with Asian ginger soy dressing and mango salsa, and garnished with the wonton matchsticks. Visually stunning it exceeded our expectations on the palate. Next, we had a Fresh Salt Appetizer of Lobster Wonton made with Maine lobster and Asian cabbage presented with a yuzu-wasabi dipping sauce. 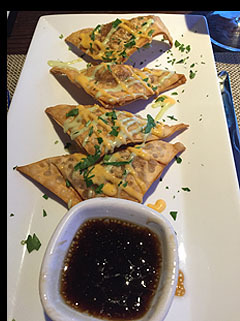 These were crispy golden wonton triangles filled with delicate lobster meat and cabbage that packed a delectable contrasting punch of texture and layers of flavors. 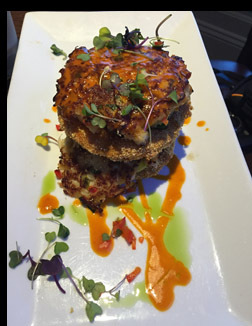 We also had the Crab Cake Stack, which Chef de Cuisine Gese Rodriguez had created as a special appetizer for the evening that consisted of succulent crab cakes layered with cornmeal crusted fried green tomatoes. This was another great pairing of fresh sea and land flavors, as well as continuing the contrast of textures on the palate. 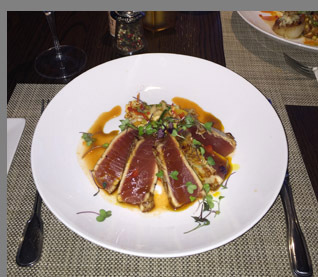 For our main courses, we had the Seared Yellowfin Tuna Steak off the regular menu, and also the Diver Scallops, which was a special entrée for the evening. The Seared Yellow Tuna Steak was gorgeous; sliced tuna attractively presented with cucumber-fennel kimchi, julienne peppers, orange soy sauce, and garnished with micro-greens. 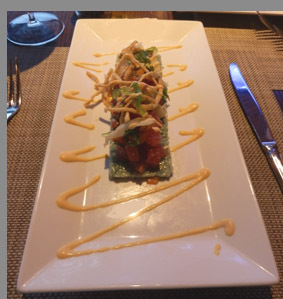 For this course, we paired a Pinot Noir from Robert Mondavi, Private Reserve from California, which had nice dark fruit and spice notes on the nose that delivered on the palate, without overpowering the tuna. 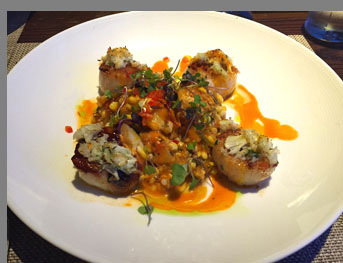 The scallops arrived as four golden pan seared Diver scallops presented around a colorful mound of sweet corn, grilled peach, baby heirloom tomato compote, topped with crab brûlée that heralded the deliciously fresh taste of summer. We paired this course with a glass of Sauvignon Blanc from Oyster Bay, New Zealand, which had a fruity, aromatic nose that followed through with a rich mouth feel and nicely complemented the scallop combination. 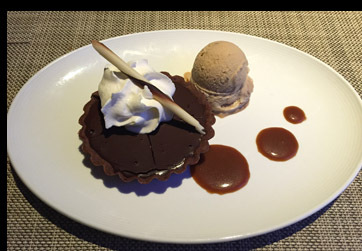 For dessert, we shared Pastry Chef Stephanie Schroeder's and Assistant Pastry Chef Jillian Gagel's ultra decadent Salted Caramel Chocolate Tart presented with Espresso-Caramel Sauce and Espresso Gelato, which was lovely and the perfect dinner finale. 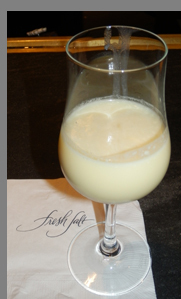 We ended the evening with after-dinner drinks of Anna's Creamy Limoncello and Anna's Creamy Orangello created by Restaurant Manager Anna Iacoletti who hails from Naples, Italy. Served chilled, Anna's Creamy Limoncello tasted like luscious liquid lemon pie, and Anna's Creamy Orangello reminded us of eating a very tasty adult version of a Creamsicle®. Once again, from start to finish, dining at Fresh Salt was a memorable experience of well-crafted cocktails, exquisite food, and excellent service. For the summer months, there is live music on the terrace, weather permitting, from Sunday through Thursday, and on Fridays from 6:30 pm - 7:30 pm, there are drink samples and giveaways from spirits companies at their Marina Bar. Read the interview with Chef de Cuisine Gese Rodriguez in the Chefs' Recipes section where he graciously shares his recipes for: Seared Tuna Steak with Red and Yellow Peppers, English Cucumber, Fennel, Napa Cabbage, and Kimchi Sauce; and Pan Seared Diver Scallops with Fresh Sweet Corn, Baby Heirloom Tomatoes, Peaches, Parsley, Cilantro, and Chives. Read about our experience at Saybrook Point Inn & Spa in the Hotels and Resorts section. 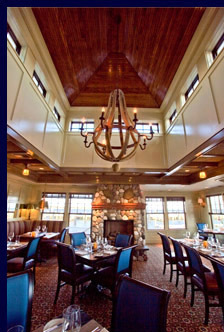 Read about our experience at the Saybrook Point Inn & Spa - Sanno, in the Spas section. Read more about the area in the Destinations and Adventures sections. Follow Luxury Experience on Facebook: www.Facebook.com/LuxuryExperience to see more photos and watch video clips. © June 2016. Luxury Experience. www.LuxuryExperience.com All rights reserved.